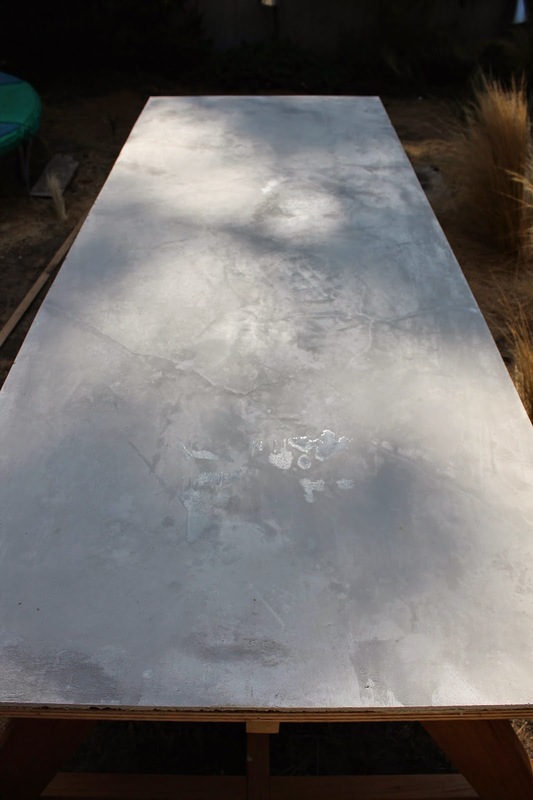 Earlier this summer, I posted about this picnic table base that I built, but left a teaser about the concrete top. Well, here it is finally completed. 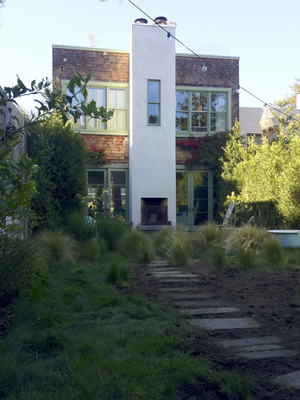 I chose to go with concrete because I wanted something that would look good and weather well. I considered zinc or copper, but this table is located in a very sunny location and I was worried about it being too reflective. My main concern about concrete was the weight. I didn't want this table to be un-moveable and anyone who has ever hauled a bag of quikrete knows how heavy that shiz is. To keep the weight down, I poured and troweled a thin layer of concrete on top of a 1" plywood base. 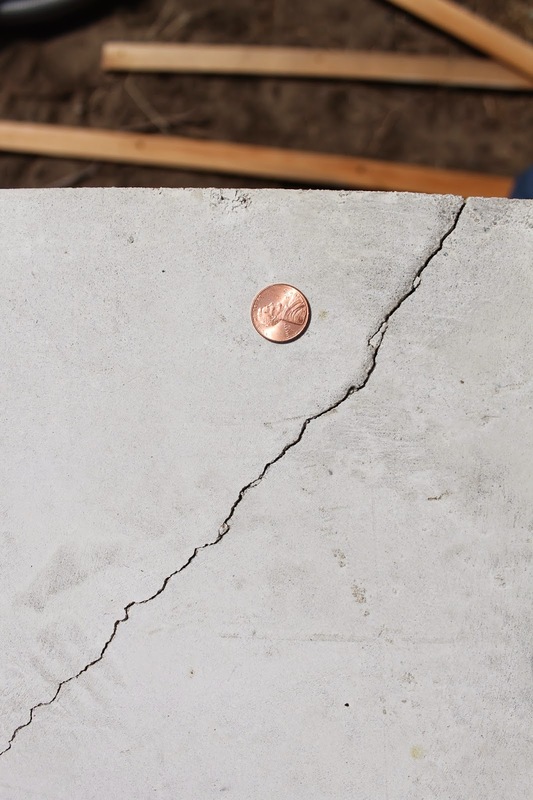 This is 3/8" thick, which is the minimum thickness that the quikrete countertop mix calls for. This mother is still heavy -the top is 30x96", so it required one and a half 80 pound bags or 120 pounds in concrete alone. I chose not to use any reinforcement and I'll go into that in a minute. I used cedar 1 3/8" lath to create a boarder around the plywood top, which was already screwed to the table base. I was hoping that the pieces I used for holding in the concrete would survive the concrete pouring process and not need to be replaced with fresh pieces so I took extra care in their placement. I also blue taped everything and tarped over the base. Good thing too, because the whole pouring and troweling thing is a messy, frantic process. My personal experience with quikrete is that it requires a lot more water when mixing than the directions say. This was the case here and also when we poured a bunch of slabs as door stoops. We used one of those mixing whisks on the end of a drill and a shovel, and mixed one bag at a time. Oliver mixed the second bag while I was troweling. I didn't use any color pigment so mixing one at a time was ok. I don't have a picture of the first part of our pour because it took both Oliver and I to tackle this. 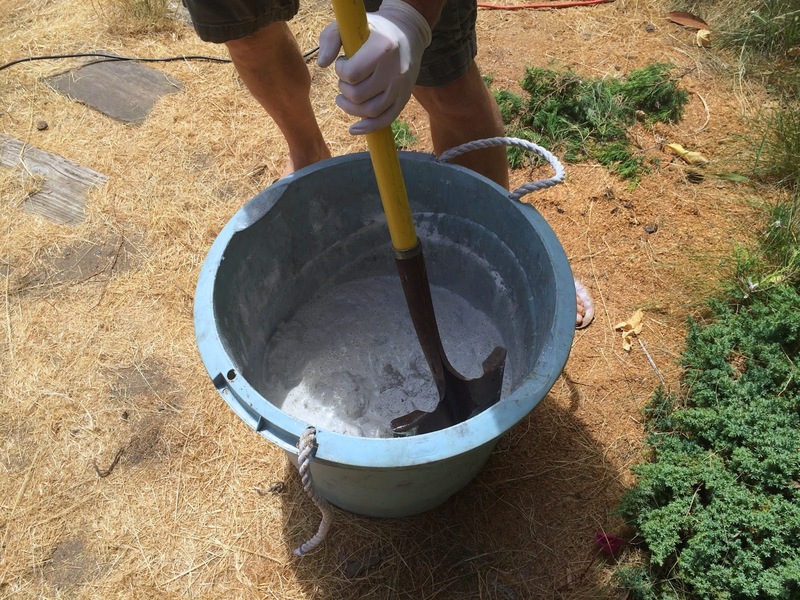 After lightly moistening the plywood with a spray bottle of water, dump a mound of concrete onto the surface. Wetting the plywood prevents it from sucking moisture out of the concrete. Lay a long board on top of the slab framework (in our case those slats) and draw it side to side while spreading the concrete. This levels the concrete and gives it a relatively even thickness. After that, trowel like mad. It's ok to spray the top a little with water to help in troweling but don't use too much or the texture of the concrete will change. I was able to trowel for about an hour before this set up and I was working in the sun. Unfortunately the blue tape didn't really work. The shuffling of the leveling board chewed it up so I ended up having to redo the cedar border. Now back to that reinforcement issue....Yes the top cracked. I'm not entirely sure why this happened and whether some chicken wire embedded in there would have helped. Two things happened here. 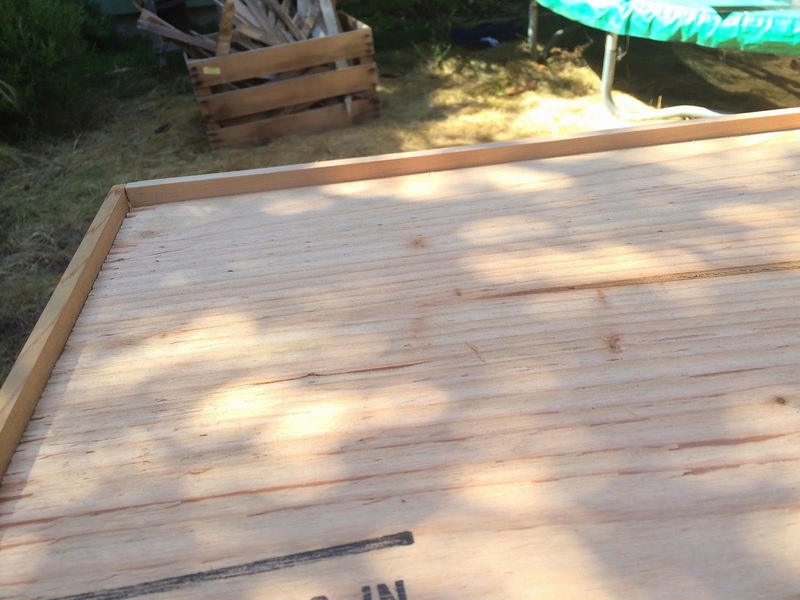 First, the plywood sheet warped. In the back of my head, I knew that I should have sealed the underside of the ply with paint to help with this. Any wood (even ply) will dry and move unevenly if one side is sealed and the other is unfinished. It just has to do with how it is absorbing and releasing moisture. So the plywood base warped away from the concrete and then (the second probable cause) Kit was using the table top as a diving board for the trampoline. Anyhoo, next came patching those cracks. I used Quikrete patch compound which worked great for filling the cracks but the color match wasn't great so I had a small problem. It looked like I was going for a faux marble job. Yuck! So I skim coated and lightly sanded the entire top twice to even out the color. I watered down the product pretty heavily to do this but the adhesion was still fine. After about a week of drying time, I sealed with Cheng's water based sealer which is also food safe. I would have liked to not have had to seal the concrete at all (I've come to realize I don't really like overly shiny concrete) but I think staining would have been a big problem. The sealer I used is a satin finish so it's sealed but not too plastic-y. This has been a hugely satisfying project. I just love this table. 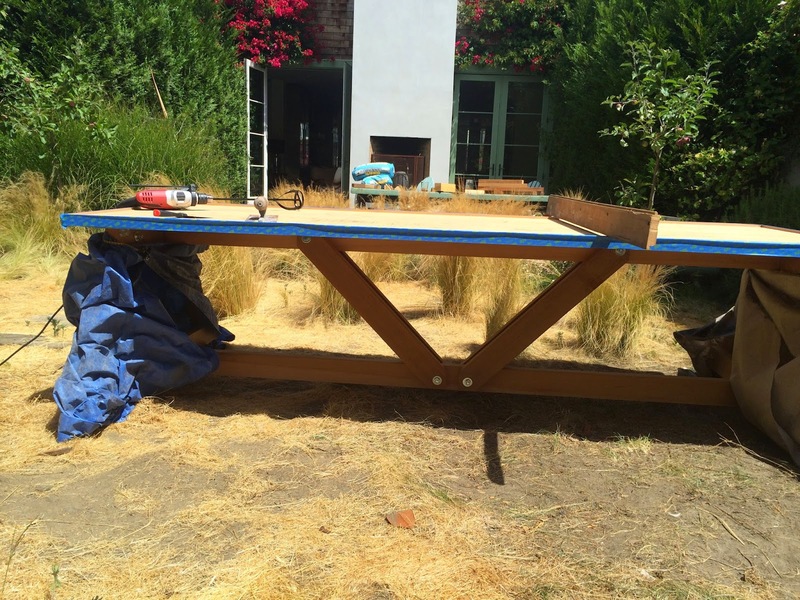 This table was built with only a chop saw and a drill press for major machinery. Up next are benches which I'm having a hard time deciding on the design. I think I'll build again in cedar but am still unclear on everything else design wise. I hope this inspires someone to go out and build something! Wow - That's one seriously impressive table - it looks huge! Can't wait to see the benches! OK! Can I have the same ?:)!!!! I think you honored your old picnic table doing this ...such hard work but so paying off! It's 8 feet long but photos make it look like a runway! Wish the benches would just magically appear, I'm kind of dreading making them.